I have always liked contemporary art, and the Hirshhorn Museum and Sculpture Garden always has exhibitions that I find both visually appealing and highly thought-provoking. Additionally, the circular shape of the building always contributes to a unique exhibition experience. The more museums I have visited the more I have realized how much the space contributes to the exhibitions as well as the overall museum experience. I went to the Hirshhorn with one exhibition in mind which was “Bettina Pousttchi: World Time Clock.” The Hirshhorn Galleries include the space that are the circular hallways between the larger gallery spaces in-between and have some really cool exhibitions in which the curved wall seems to amplify the art even further. “Bettina Pousttchi: World Time Clock” showed images of public clocks, all taken at the exact same time of day, but in different cities- in 24 times zones, as I double check the museum website– pretty amazing. It is clear that the artist put a lot of energy into the show. The exhibition may appear very simple at first glance, but it took eight years to put together the artwork due to the differing time zones. 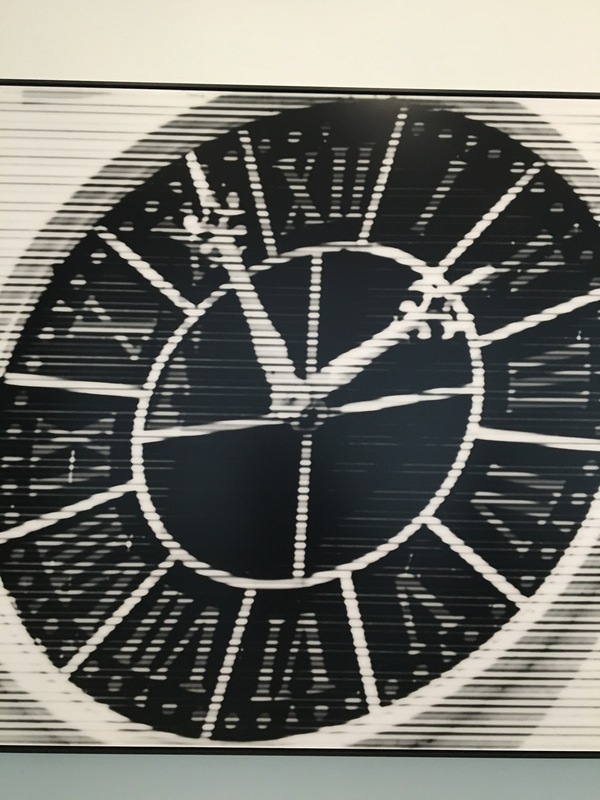 The black and white of the clocks seemed to emphasize the time aspect as color may have distracted from that important element. There is something about the circular aspect of the museum that makes walking through the exhibition that much more interesting. I also looked at many items from the Hirshhorn’s collection that were on display-Helen Frankenthaler, Joan Miro, Jean-Paul Riopelle, and Alexander Calder. I always enjoy seeing a mix of well-known artists with artists that are a bit less known. Mario Merz, “From Continent to Continent.” Photo by Hanna Cunningham. Building off of number 1…the sculptures are often thought-provoking and unexpected (like the one shown above). Check out this Washington Post article about a sculpture that greets visitors in the garden. The space/ layout / building itself provides a one-of-a kind museum experience, and you can see most of the museum in one visit. The Hirshhorn has a number of exciting shows coming up including “Yayoi Kusama, Infinity Mirrors” in February 2017. I have seen a lot of articles about this exhibition and it is highly anticipated. One writer even expressed concern over the amount of time visitors are expected to spend in the exhibition taking photos with possible long wait lines to get in. Should be very interesting…but I am still planning to brave the wait if necessary. All photos and video by Hanna (me). Hi Hanna! As someone who rarely gets to museums but loves them, I really enjoy your blog posts. The pictures complement the posts well and I love that you summed up at the end why we should visit the Hirshhorn. Also, I like that you used a slideshow to showcase the photos so the post didn’t become too cluttered. Great job! Hi Talia, thanks so much for the feedback. I am so glad you are enjoying the blog. Hey Hanna! I love reading your blog. I have a bucket list of museums to visit in DC and this will definitely help. I like the layout and organization of this post. It is easy to follow and includes the main reasons to visit the museum. One suggestion would be making the header image a bit smaller since it takes over the page, which distracts the reader from the content. Hi Jess- I am so glad you like the blog, and thank you for the suggestion. Hanna — I really enjoyed your personal insights about the Hirshhorn, mixed in with information and details about the museum itself. The point you make about the design of the building impacting the overall experience of the visitor is incredibly accurate, and can be seen throughout a multitude of other museums like the Guggenheim or the Louvre. At one point, there was a slightly funny, slightly terrifying plan to put a giant bubble on the inside of the Hirshhorn — the idea was killed after discussion of it operating at an annual loss of $2.8 million. Check the story out: https://www.washingtonpost.com/entertainment/museums/bursting-hirshhorns-bubble/2013/07/16/1c8add64-ed6d-11e2-9008-61e94a7ea20d_story.html. Hi Belle- thanks for the feedback. Great to hear you liked the post! And yes- the Guggenheim definitely came to mind for me when I was writing about the type of building. Hi Hanna–I thought this post was really insightful and gives readers a great glimpse into the Hirshhorn. I’m someone who really enjoys going to art museums, but I often need someone to explain to me what I’m looking at. You did a great job of breaking it down and provided some great visuals. I especially liked the summary you gave at the end and how you noted upcoming shows–it was a great way of wrapping up the article and giving the highlights of the museum. Hi Elissa- I am glad you like the post. I definitely felt like this exhibition needed a little extra explanation including background information, so it is good to hear that it was useful for you.